Let’s see…there was pasta and cocktails, wine and scalloped potatoes, tenderloins, tapas, cheeses and cider, pancakes and eggs benedict, breakfast smashers and christmas cookies. You get the idea….we did a LOT of eating this holiday season, and that wasn’t even half of it. Don’t get me wrong, it was all delicious but over the past couple days I’ve felt a bit weighed down. I’ve been craving soup…something healthy, filling and full of tasty vegetables. 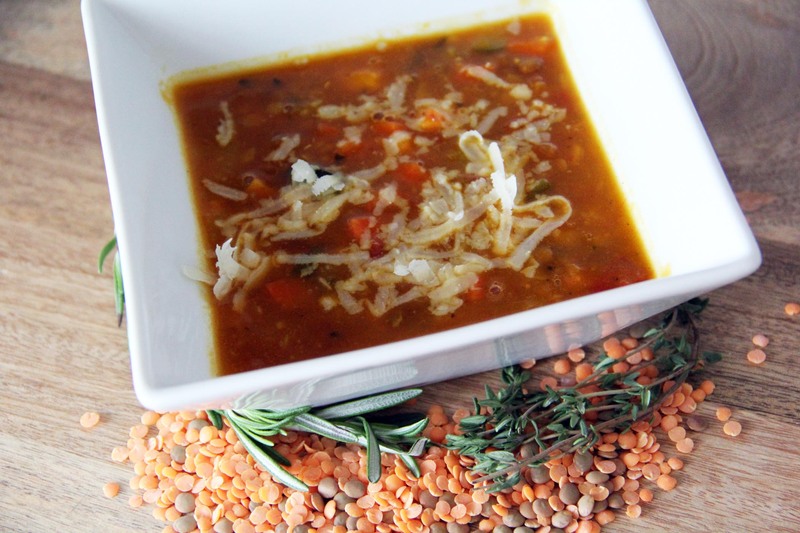 My Sweet Potato Lentil soup was just what I needed to get me back on track. It’s warming with a hint of sweetness from the sweet potatoes. Chop onion and sauté in large pot with olive oil. Add a few turns of the pepper mill and cook until the onion has wilted a bit. Add some salt (to your liking) and cook for a couple more minutes. Next, add in the chopped carrots, cover and cook for about 5 – 10 minutes stirring occasionally. 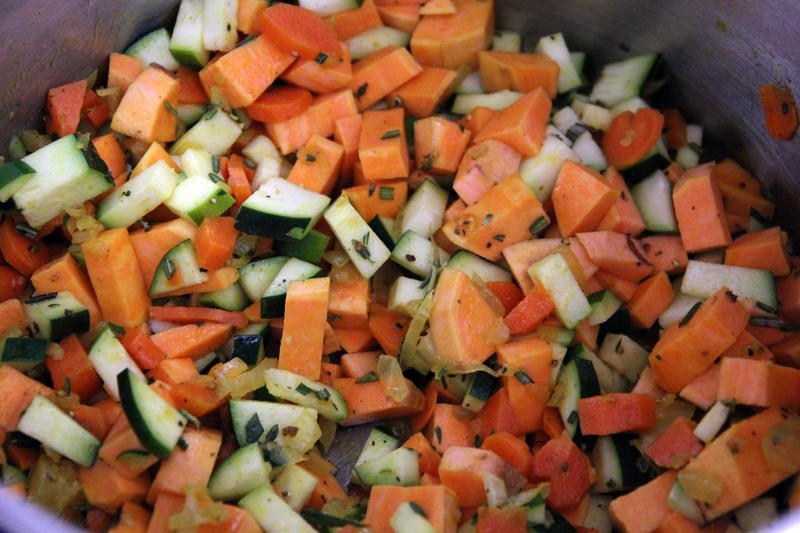 Throw in the zucchini and sweet potato, some more salt and pepper and fresh herbs. Cover and cook until your veggies begin to cook down and the sweet potatoes start to lightly stick to the bottom of the pan. Anything that sticks to the bottom = flavor so don’t be afraid if you have some browned bits before adding any liquid. Add a tiny bit of veggie stock to cover the bottom of the pan only. Add garlic and cook until it begins to perfume the air. 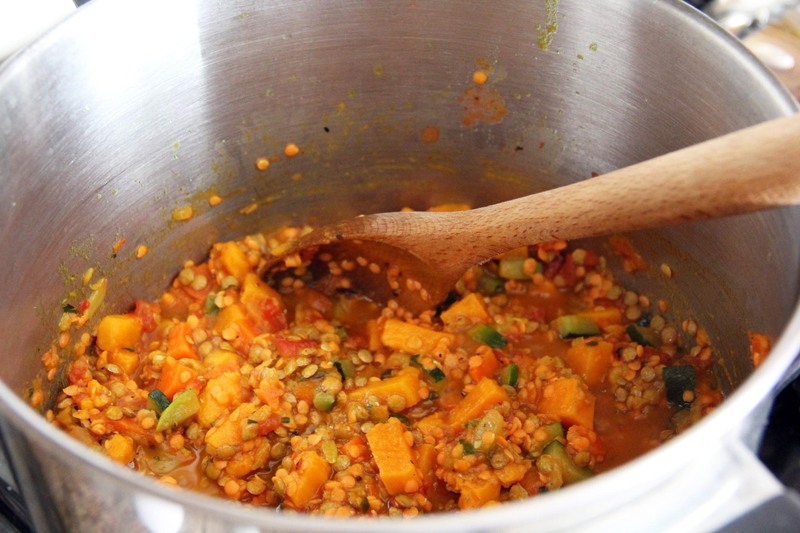 Incorporate the pureed stewed tomatoes and lentils. Stir everything together and cook for a few more minutes before adding any stock, giving the pot a stir in the process. Pour in white wine and cook until you can’t really smell it anymore (only a couple of minutes). Once that happens, add in the vegetable stock. 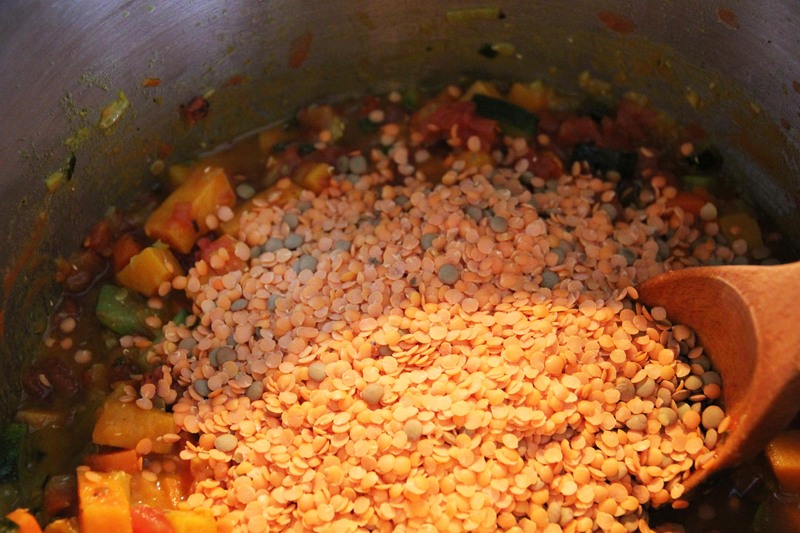 Bring to a low simmer and cook until lentils are soft. I also added a cup of water to my soup this time, just to thin it out. No soup I make is ever the same so I’m always adding a little bit here or there. At the end I always taste for seasonings and usually add some extra pepper or salt to get the right flavor combo. 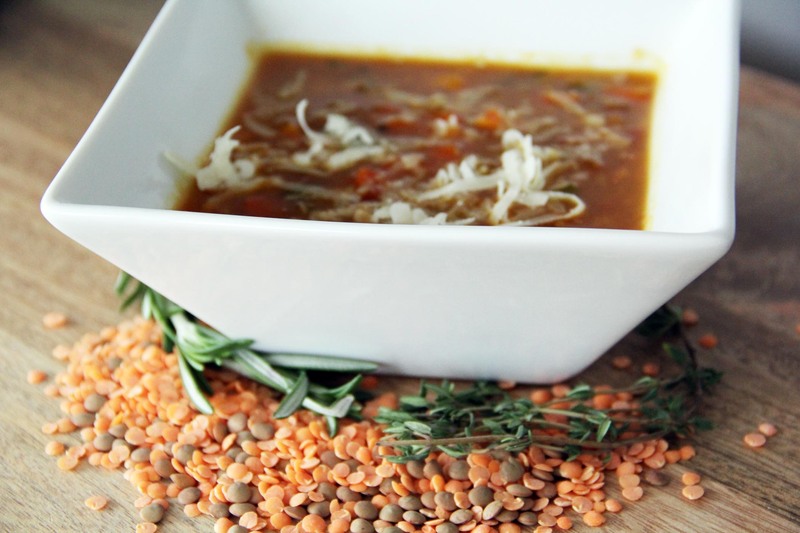 I love this soup served with some freshly grated parmesan cheese or pecorino Romano on top. I had two bowls and had to stop myself from a third. I hope you all had a wonderful holiday and here’s to a happy & healthy New Year from my kitchen to yours! As always, this looks delish! !